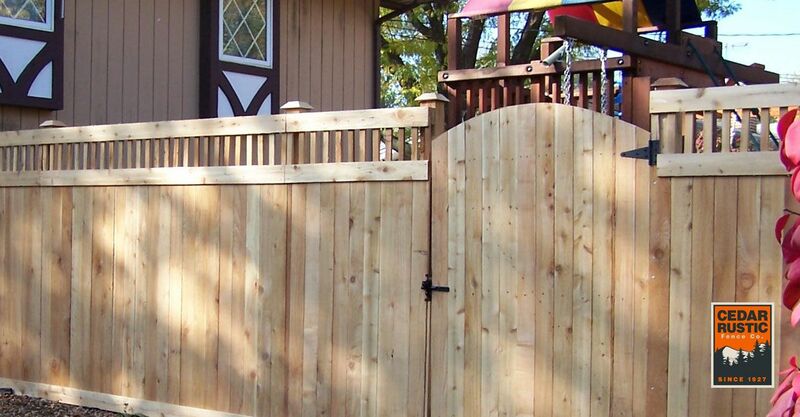 Your handsome, practical cedar fence from Cedar Rustic Fence Co. will not only increase the value of your home, it will enhance your outdoor living experience. 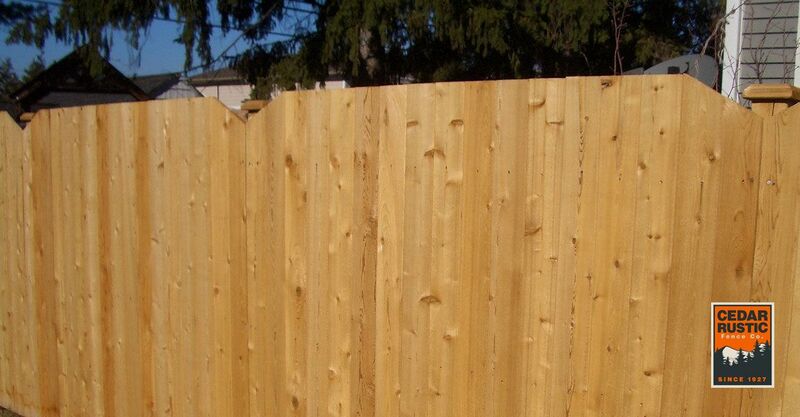 Cedar’s natural colored grain, tight knot structure and beautiful aroma create an esthetically pleasing fence. Unlike pressure treated material, cedar is naturally decay resistant, dimensionally stable, and a low maintenance material that you will enjoy for years to come. 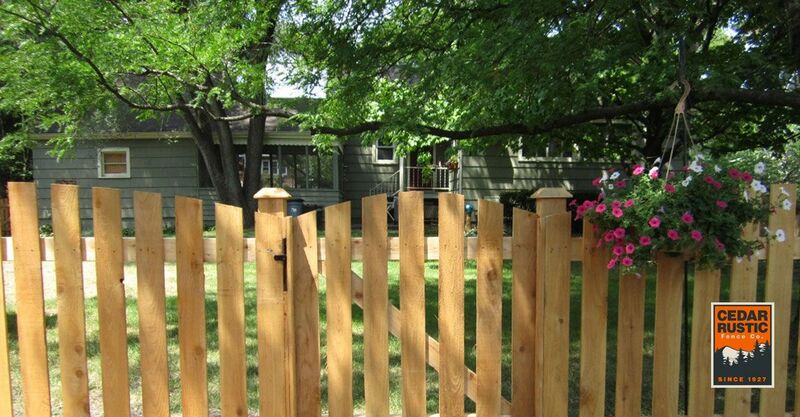 Cedar Rustic Fence Co. has been hand-crafting beautiful cedar fences since 1927. We buy our wood directly from the finest mills, custom build each panel in our shop, and then carefully install your fence with pride. All of our cedar fencing material is unwrapped, inspected, and stored inside our 86,000 square foot climate-controlled warehouse. You can be sure that the wood on your Cedar Rustic fence is fresh, clean and of the highest quality. Each cedar fence installed by Cedar Rustic Fence Co. is hand-crafted in our shop. We use custom jigs to ensure that each panel is the same size, has consistent spacing, and has a similar pattern. 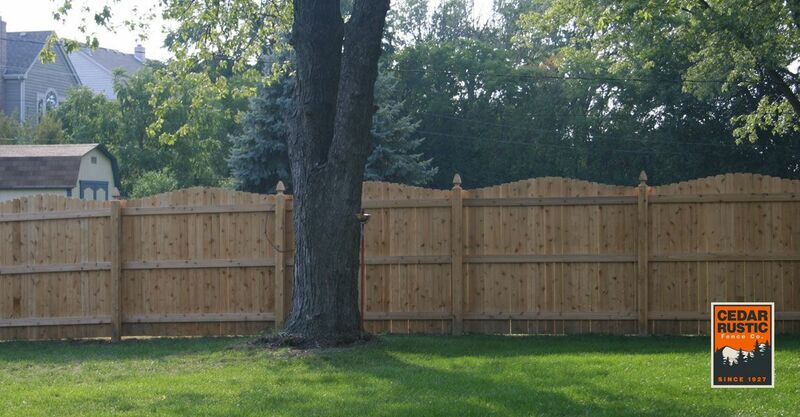 There are cheaper methods to build a fence on-site; however, we do not believe in compromising quality. 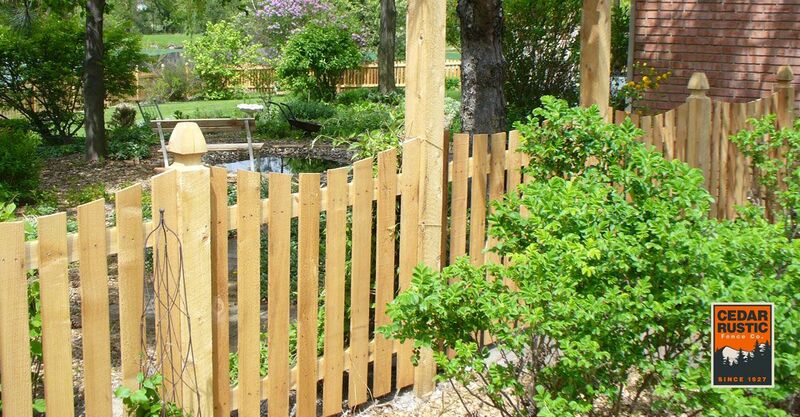 Celebrate nature in your yard with a cedar fence from Cedar Rustic Fence Co.
Take a look at this beautiful cedar fence! This 6’ Hampton I is constructed using 1×4 boards and 4×4 posts with beveled caps, with a face-nail construction. 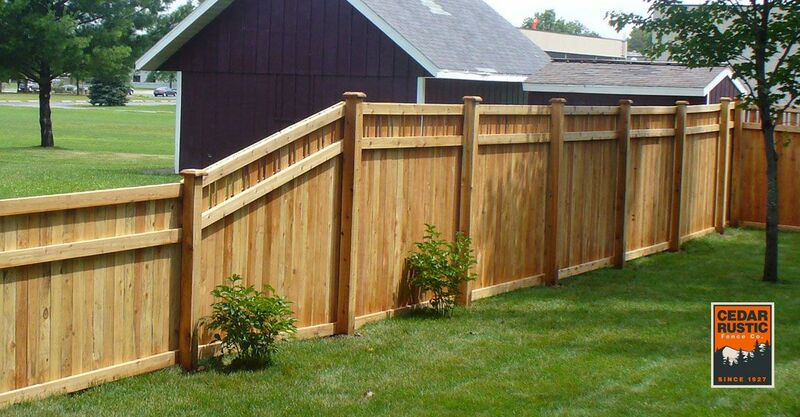 A transition was used to gradually change the height from 6 foot to 4 foot tall fence. 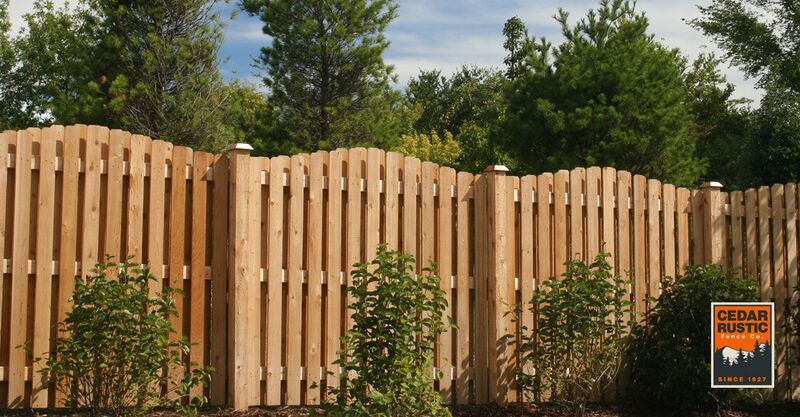 The Hampton II cedar privacy fence, shown from the inside of the yard, is simply gorgeous. The design creates almost an identical look on both sides of the fence, created using 1×4 western red cedar pickets, 2×4 framing and 1×4 face caps. 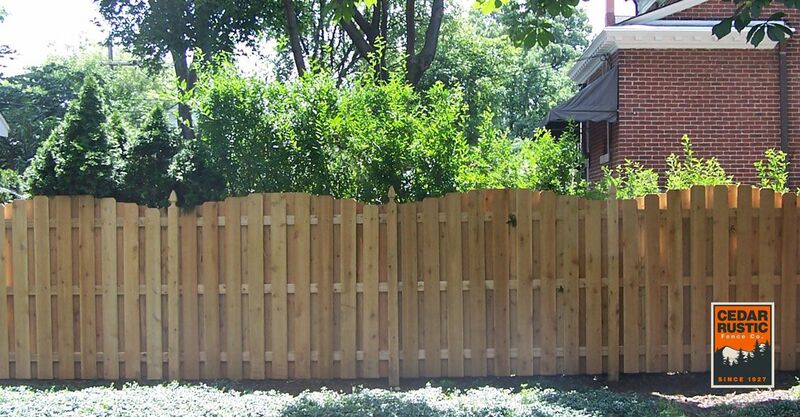 A board on baton cedar fence adds complete privacy to your yard. 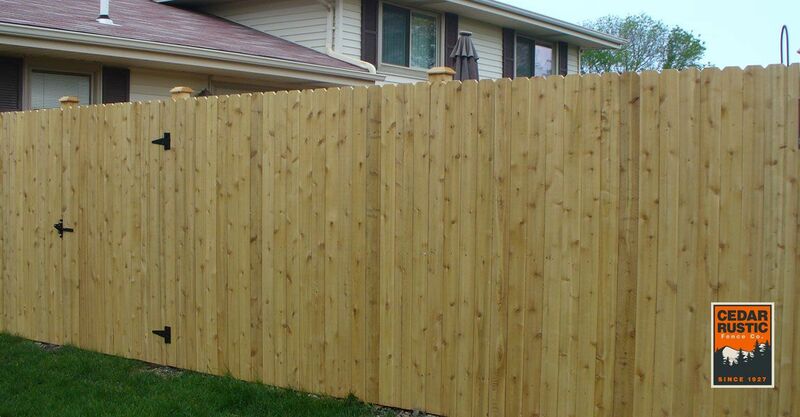 Cedar boards expand and contract throughout the seasons, causing some gaps between boards on a standard privacy fence. 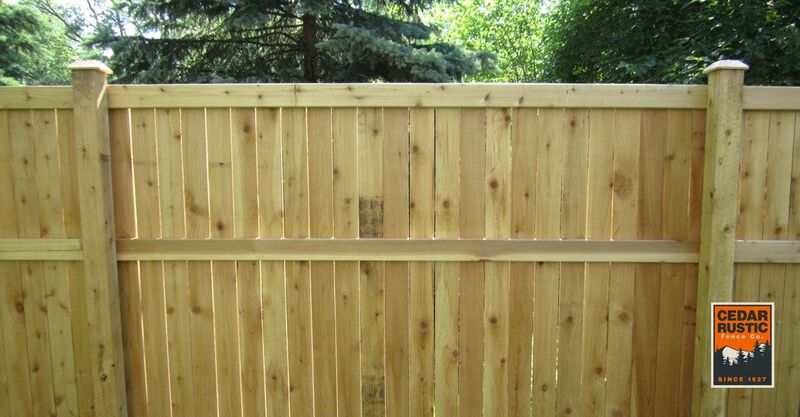 Since the boards in this style overlap, you will never see any gaps in your fence. 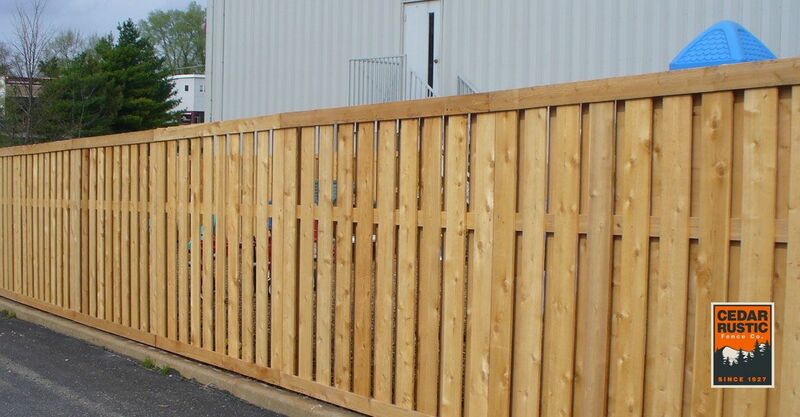 This fence is constructed using our Traditional 4-2 stack and mortised into 5×5 core cut cedar posts. 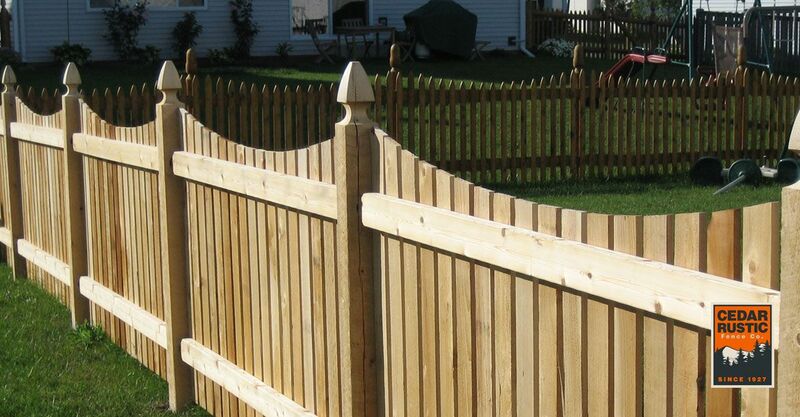 The Richmond post cap tops off the look of this elegant fence. 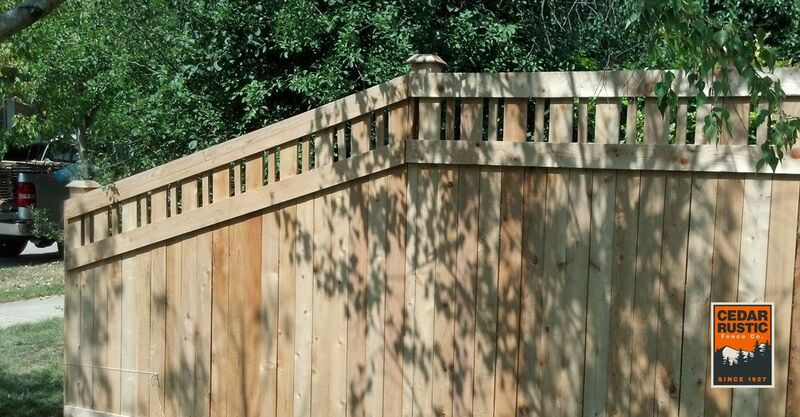 This board on baton cedar fence with Lattice top adds character to any yard. Constructed using 1×4 western red cedar pickets, diagonal lattice, 1×4 face caps and 2×4 framing toe nailed to 4×4 posts with Bevel post caps. 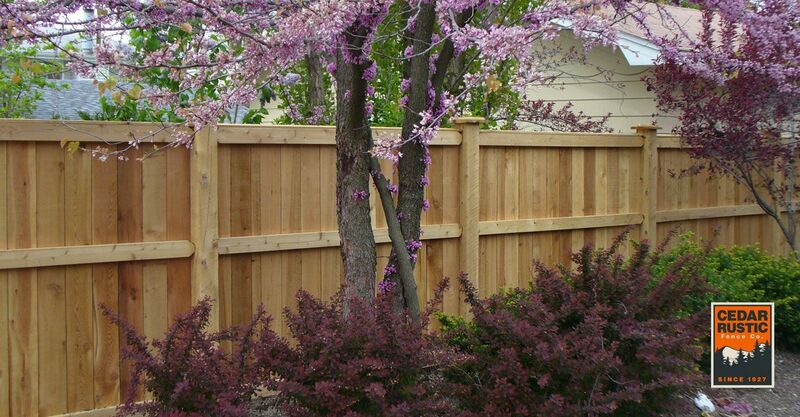 Our Hampton I privacy fence is a very popular choice among of customers. 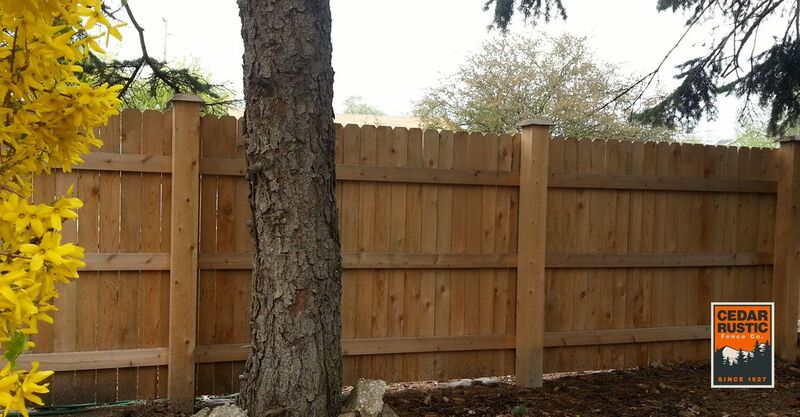 This picture shows a 6 ft cedar privacy fence transitioning to 4 ft tall fence to accommodate the regulations set forth by the village or homeowners association. This is another beautiful cedar fence installed by Cedar Rustic. This fence was constructed using Beveled barn top Gothic boards and 2×4 framing face nailed to 4×4 posts with acorn carving. Our rolling arch pattern is one of the more popular options chosen among our customers. The 4×4 posts add just a bit of character without drawing away from the beauty of the Beveled dog ear boards. Lattice, available in square or diagonal, is another topper we offer for privacy fences. This cedar fence is constructed using 1×4 boards, diagonal lattice and 2×4 framing face nailed to 4×4 cedar posts with bevel caps and stands 6 feet tall. Our Hampton II cedar privacy fence adds the perfect curb appeal when paired with this cut arch gate. This fence is constructed using 1×4 western red cedar boards, 2×4 framing, and 4×4 posts with bevel caps. 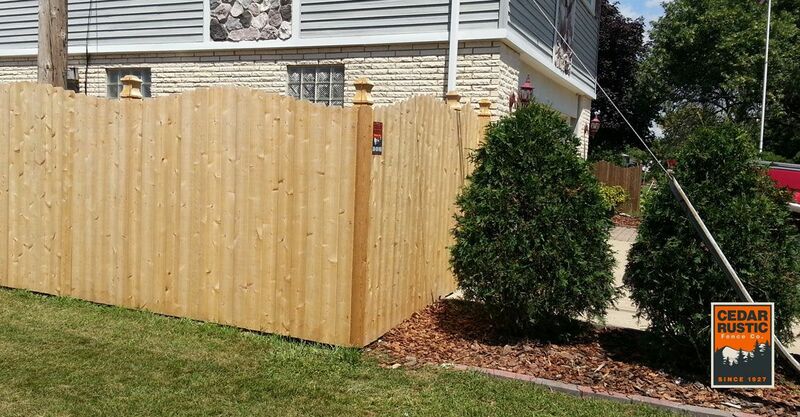 The decorative topper adds a bit of character to a standard privacy fence. A decorative commercial fence was installed at this property to provide privacy. 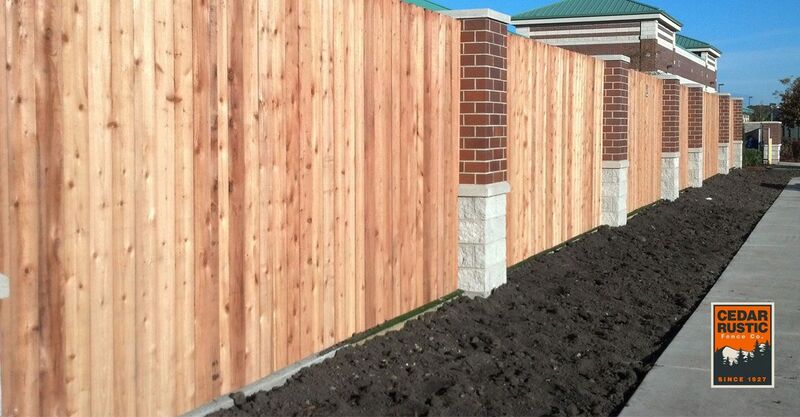 This cedar 8’ tall fence has 2×4’s attached to brick and stone columns with face nail construction. It is an excellent way to divide the business from a customer walk way. This 6 ft cedar privacy fence is constructed using our beveled dog ear pickets in a rolling arch pattern and accented with Acorn posts. Cedar Rustic’s Hampton I privacy fence provides both privacy with a decorative top for some visibility. The 5 foot tall fence follows the grade down the side yard and connects to a 6 foot tall Hampton I fence. Don’t be afraid to mix and match fence size styles. One of our most popular fences: a 6 foot tall traditional fence with 1×4 western red cedar pickets. 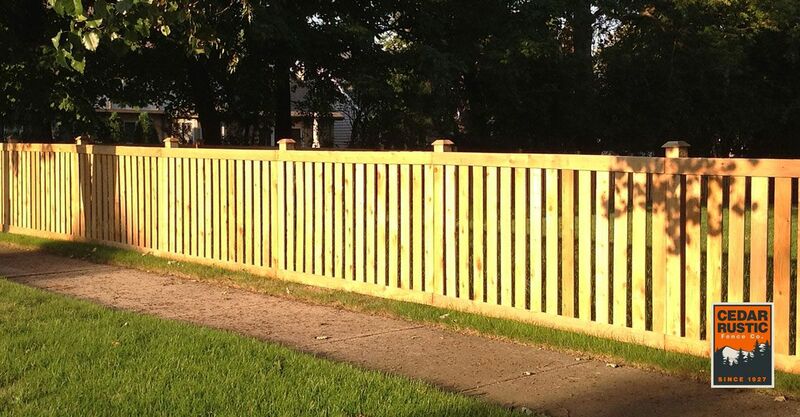 For this fence, we move the 2×4 rails to the top and bottom of the fence to give a nice clean look. This beautiful rustic fence is a classic. The round post have turned acorns that made in our shop on a 12 foot lathe. The rails are rustic ½ logs split and debarked from a white cedar tree. 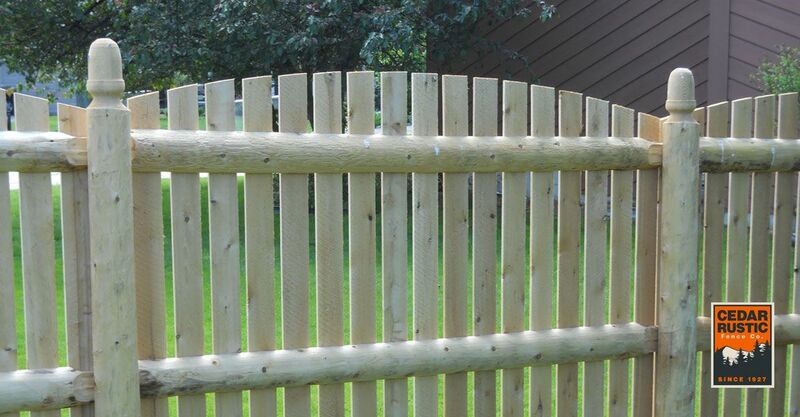 This fence has a rolling arch pattern with 1×5 white cedar pickets with dog ear tops. Accent gates add charm and character to your yard. 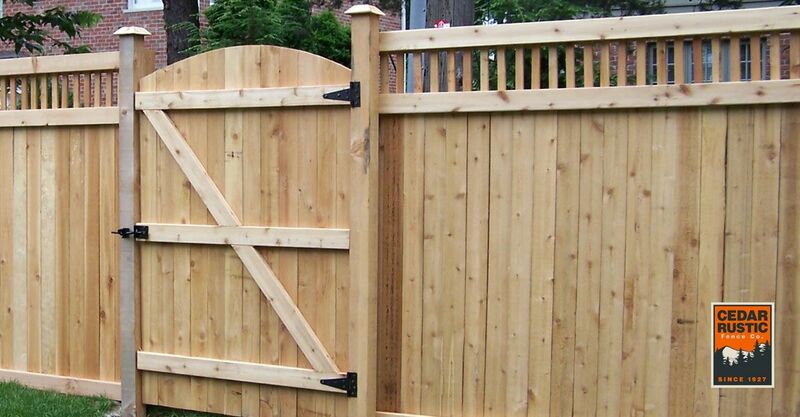 This cut arch gate is installed with a 6 foot tall Hampton II cedar fence. 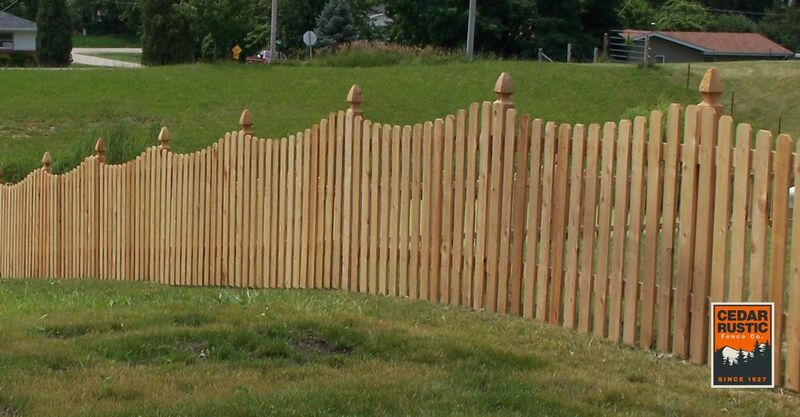 Want to maximize the height of your fence but still add some pizzazz? This v-out privacy fence from Cedar Rustic Fence Co is 6 foot. An outside view of a traditionally framed 1×4 western red cedar fence. 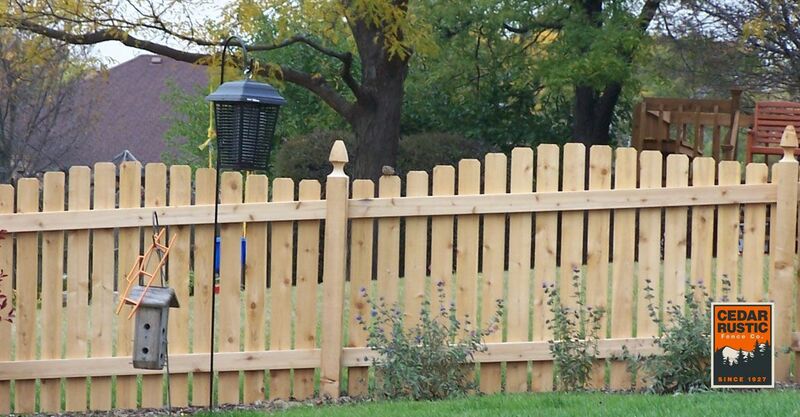 The top and bottom cap boards frame this wood fence beautifully. This beautiful rolling arch fence is constructed with 1×4 western red cedar pickets with dog ear top. The posts are 4×4 with Gothic tops. An interior view of a 6 foot tall solid wood fence that is transitioning to a 4 foot tall fence. 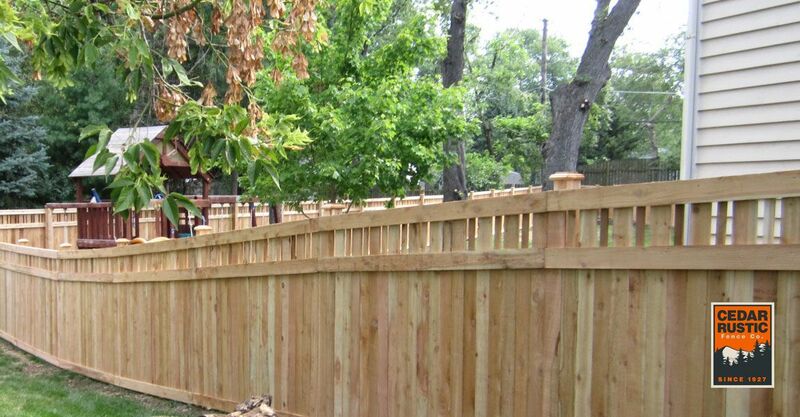 This fence is constructed with cedar material that is naturally decay and rot resistant. 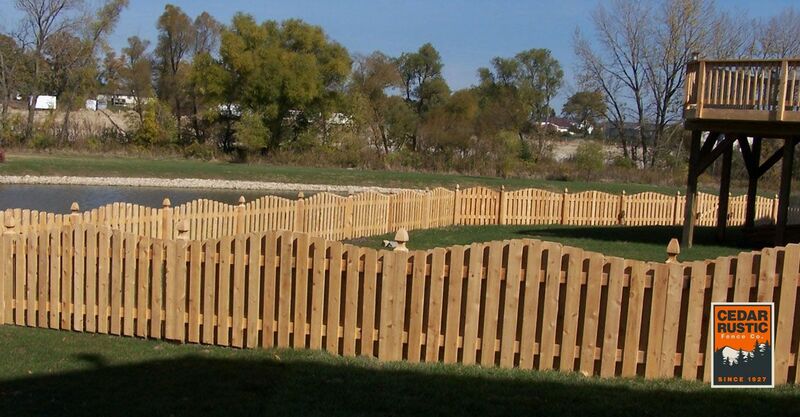 This 6 foot tall solid 1×4 dog eared rolling arch fence is a great option for keeping big or little dogs in your yard. 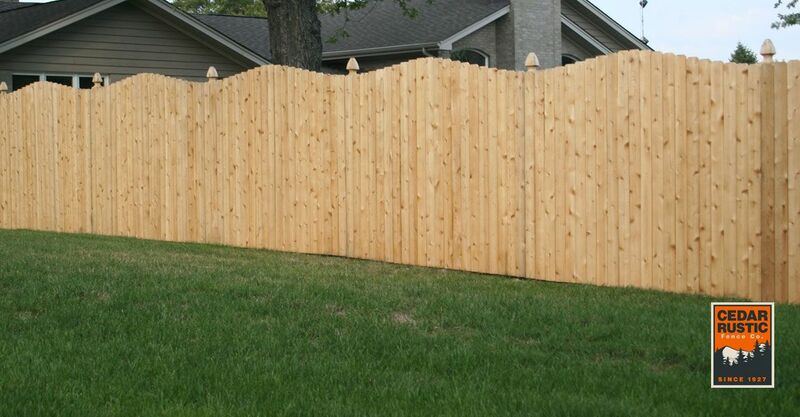 This fence is a 6 foot tall Hampton II fence has a 5 foot tall solid base and a 1 foot tall topper. It also has 3 face caps, 1×4 cedar boards on the base and 1-1/2 x 12 inch spindles for the decorative topper. Need some privacy around your pool or yard? This 6 foot solid 1×4 western red cedar dog eared rolling arch 2×4 framing and 4×4 gothic post would be a great fence for you. Cedar Rustic can help provide the ultimate sense of privacy to your home or office. 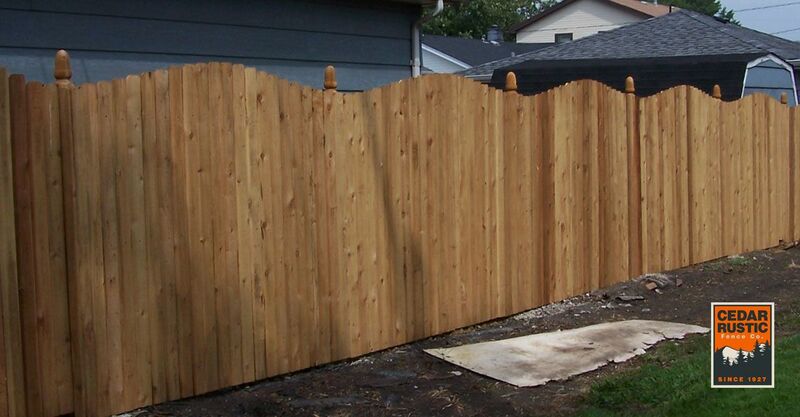 The interlocking boards of a tongue and groove privacy fence, like the cut arch model shown here, provide seamless coverage, and can even block out the headlights of passing cars. This 6 foot tall traditional fence is made with 1×4 western red cedar boards, 2×4 back rails, and 4×4 cedar posts with Richmond caps. 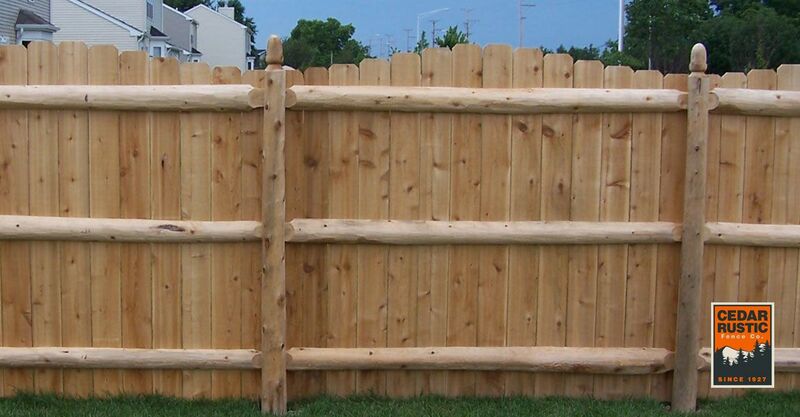 This 6 foot tall solid cut arched fence made with northern white cedar pickets, ½ log rails and round posts, is one of our top sellers. Looking for complete privacy? 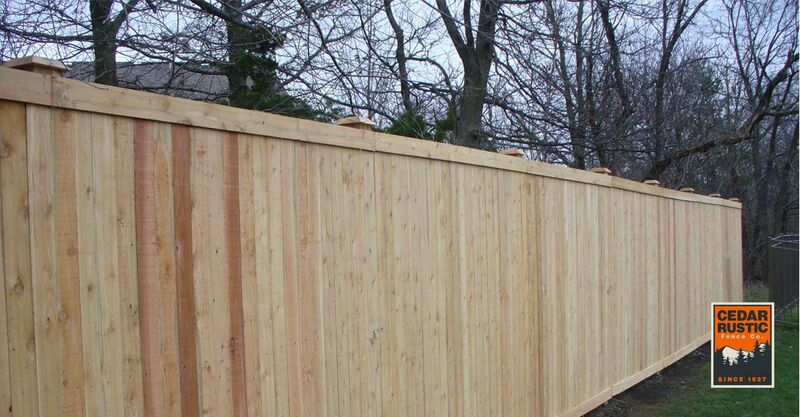 This is the fence for you: 6 ft tall, 1×6 western red cedar board & batten, with a 1×4 top cap. Face nail construction with 4×4 posts and beveled caps. Privacy with a view is a perfect style of cedar fencing. This style is a Hampton I fence with 4×4 posts, topped with Richmond caps. It has 1×4 western red cedar pickets and is face nailed constructed. It all comes together nicely with the grade of the yard. 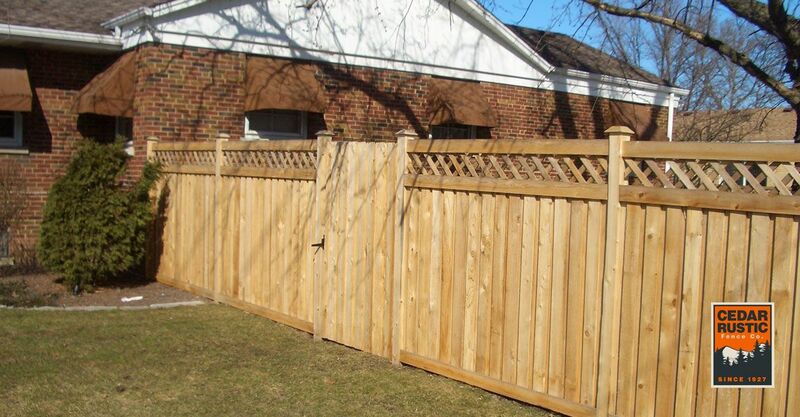 This v-cut style cedar fence has provided privacy between the homeowners yard and adjoining alley way. There are beveled dog eared pickets and 5×5 Gothic top posts to add to its uniqueness. A residential privacy fence was installed, having rolling arches and 4×4 posts. These posts have decorative Williamsburg tops and are a stylish feature. It is securely put together by face nail construction. 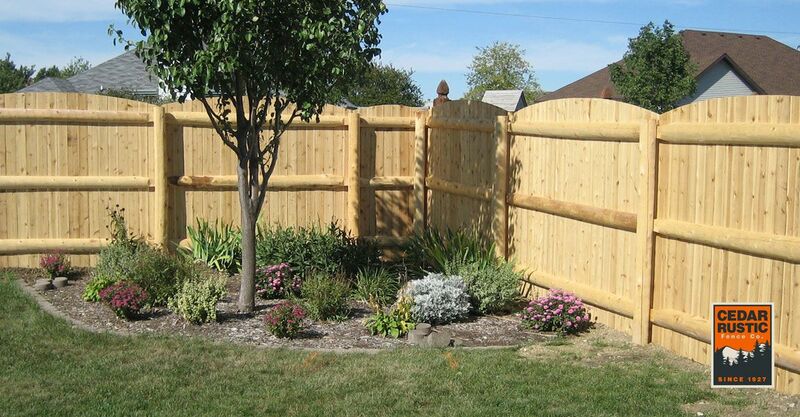 A cedar privacy fence can add the perfect balance functionality and decoration to a yard. 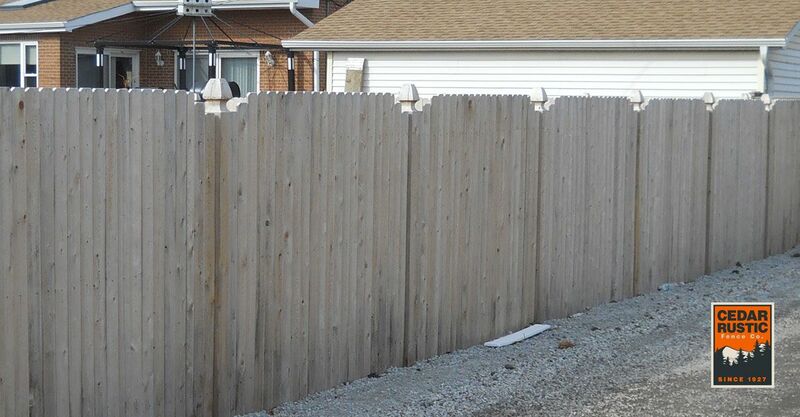 This dog eared privacy fence, complete with beveled caps, helps keep the outside world at bay while accentuating the natural beauty present in the yard. Looking for privacy with a decorative top pattern? Add this 6’ high dog eared rolling arch fence. Constructed using 1×4 boards, 4×4 Gothic post using face-nail construction. 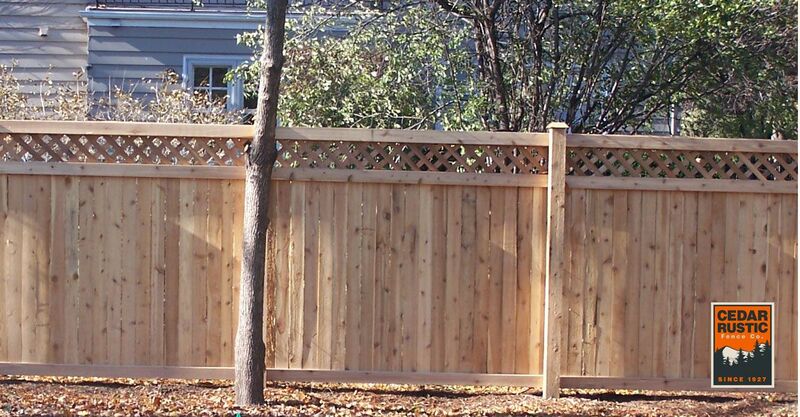 This 6’ cedar fence will give you the privacy that you are looking for. Constructed using 1×4 western red cedar dog-eared boards, 4×4 posts with beveled caps, using face-nail construction. 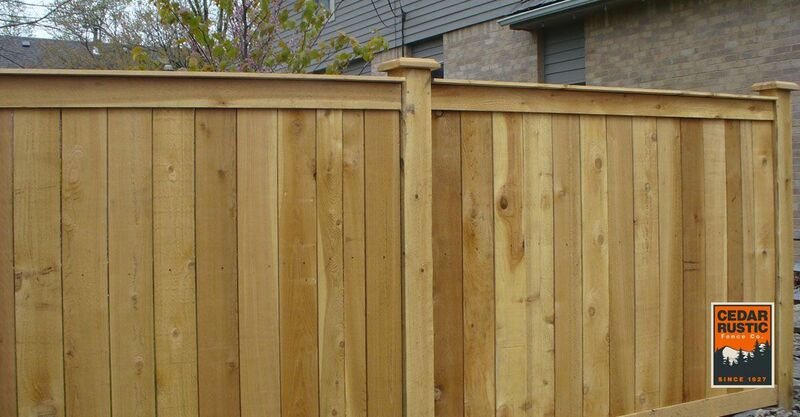 This 5’ traditional privacy cedar fence makes a great decorative privacy fence. Constructed using 1×6 western red cedar boards, 5×5 post with Richmond caps, mortise & tenon construction and 1×4 face & top caps. 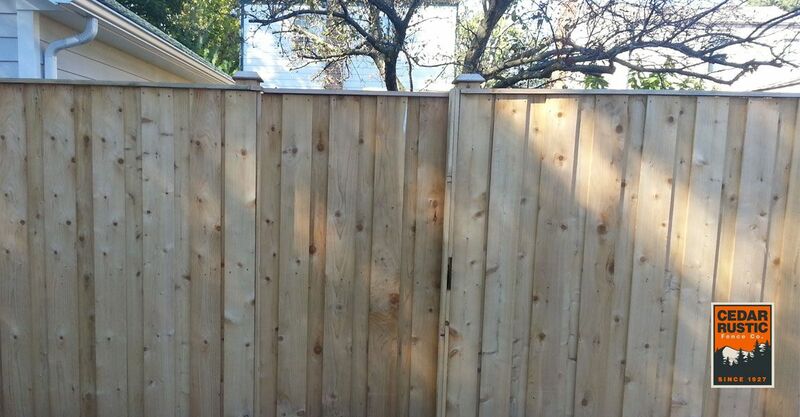 6‘ traditional cedar privacy fence constructed using 1×6 boards, 5×5 posts with Richmond caps using mortise & tenon construction. Looking for privacy and beauty both inside as well as out? 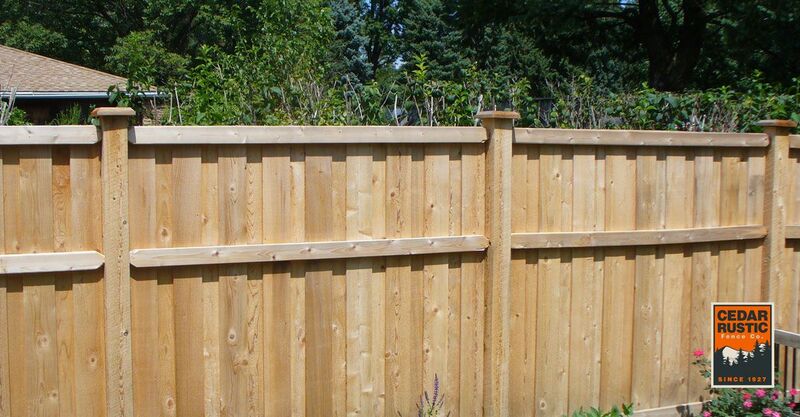 This 6’ Traditional 4/2 stack mortise & tenon fence is a beauty. Constructed using 1×4 boards 5×5 posts with beveled caps. The rolling arch pattern on this cedar privacy fence adds character to the fence line. Want the same look on both sides? 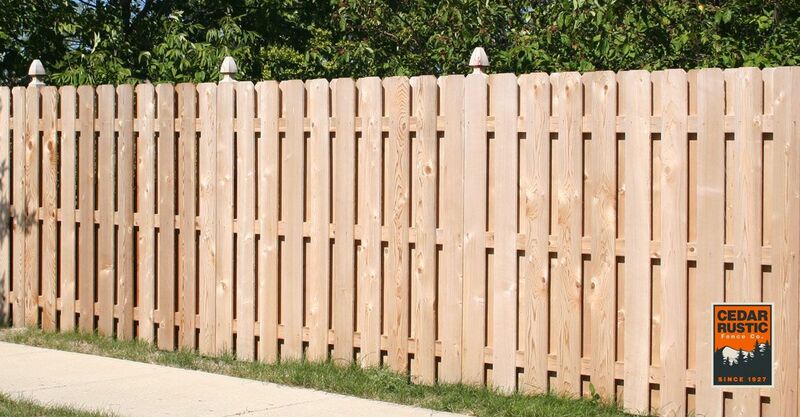 This 6’ straight top shadow board cedar fence will give you the look you want. Constructed using 1×4 boards, 4×4 posts with bevel caps using face-nail construction. 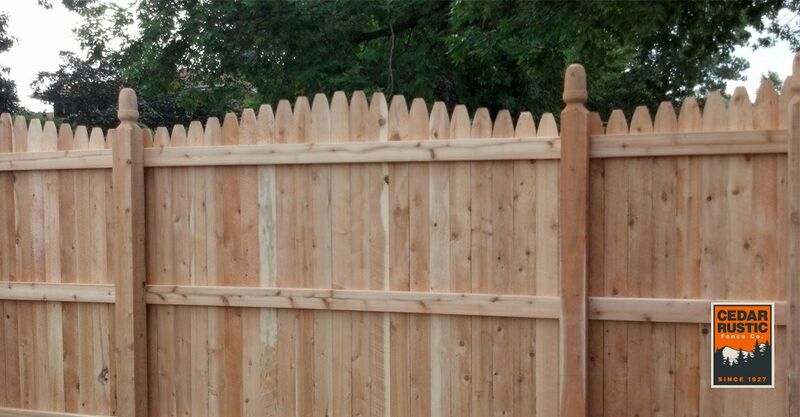 This is a great example of one of Cedar Rustic’s beautiful 6’ dog-eared, straight top shadow board fences. It is a face-nail construction using 1×6 western red cedar boards and 4×4 Gothic posts. 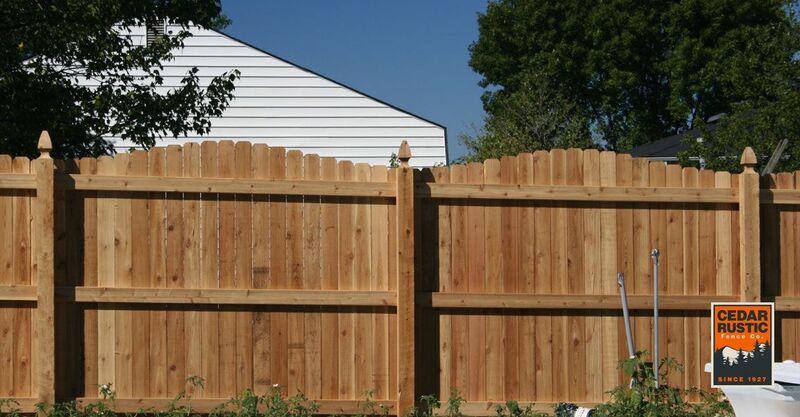 This 6 foot tall fitted shadow board fence is great for privacy and is neighbor friendly. This fence looks the same on both sides. 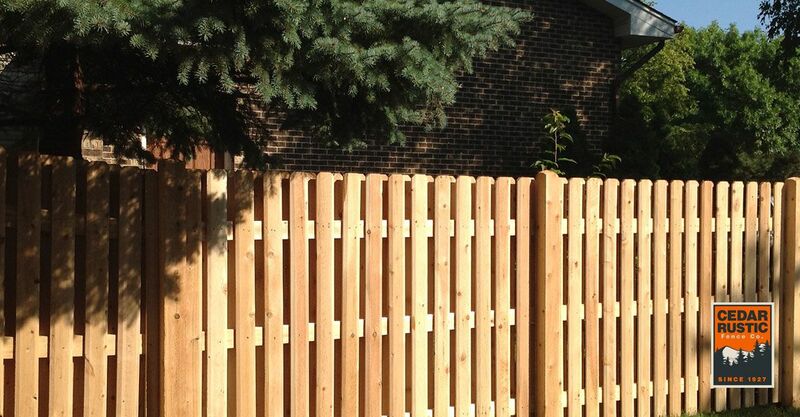 A handsome cedar fence for any yard! 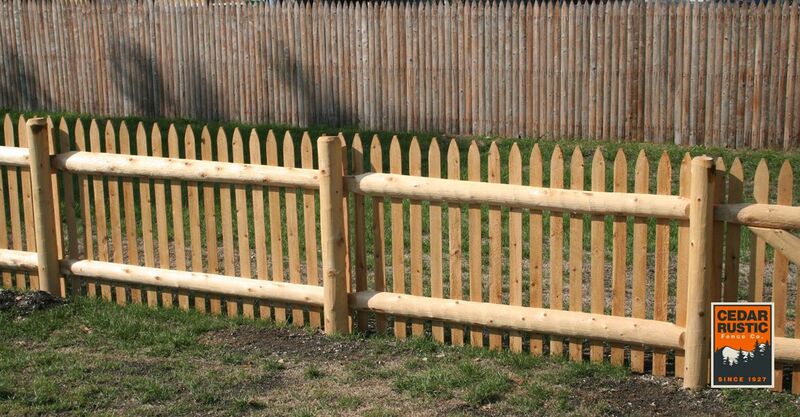 This shadow board fence includes 4×4 posts with French Gothic post tops. The pickets are 1×4 dog eared and rolling arch style. This Hampton II style shadow fence allows the owner to have privacy with a view. Beveled caps sit atop 4×4 posts next to 1×4 pickets. Added to the beauty is an arched gate. Looking for a fence with the same look and feel from both inside and outside your property? This shadow box or neighbor friendly cedar fence is a great option. 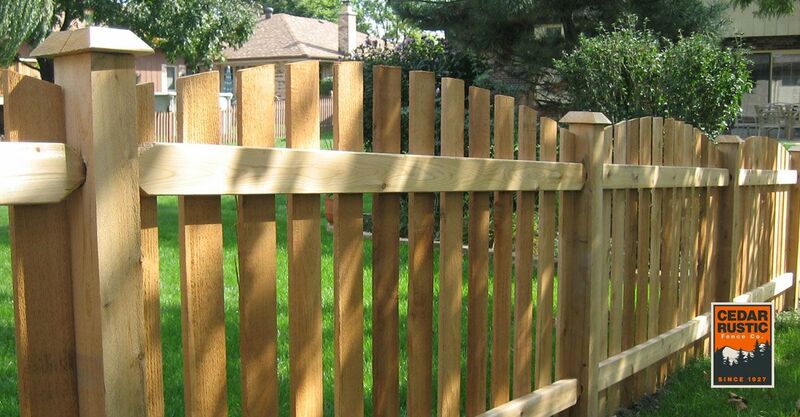 This fence is constructed with 1×6 western red cedar pickets with dog ear tops. 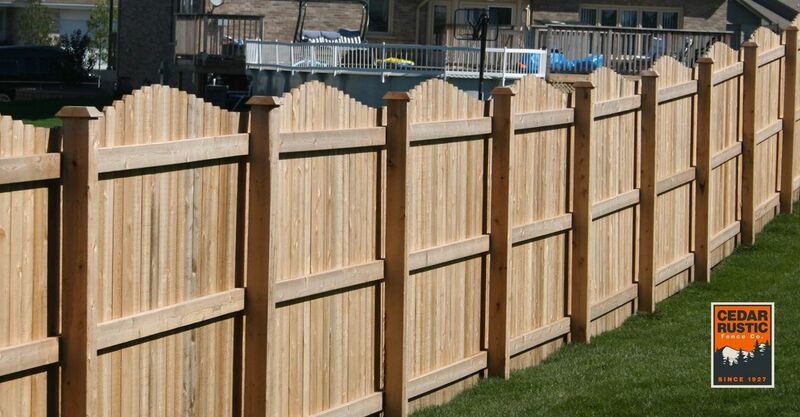 A shadow board fence can not only add privacy to your backyard, it can beautify your landscaping. 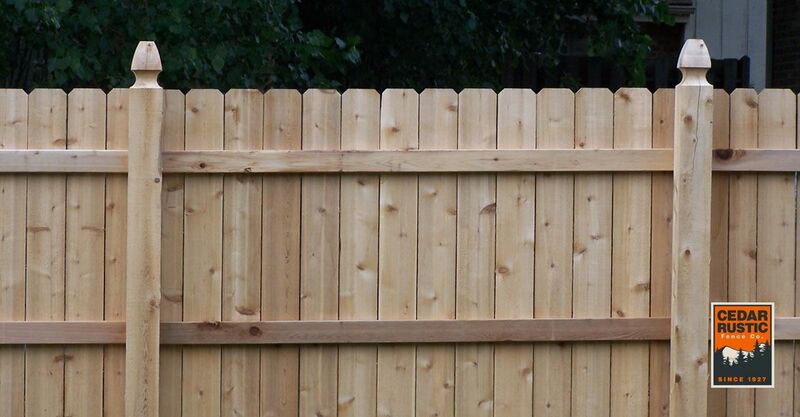 This shadow board fence is 6 foot tall with cedar posts adorned with beveled caps. Here we are looking at a friendly good neighbor fence. It is a 6ft 1×6 dog-ear shadow board western red cedar with an arch top. Face-nail construction with 4×4 Gothic posts. 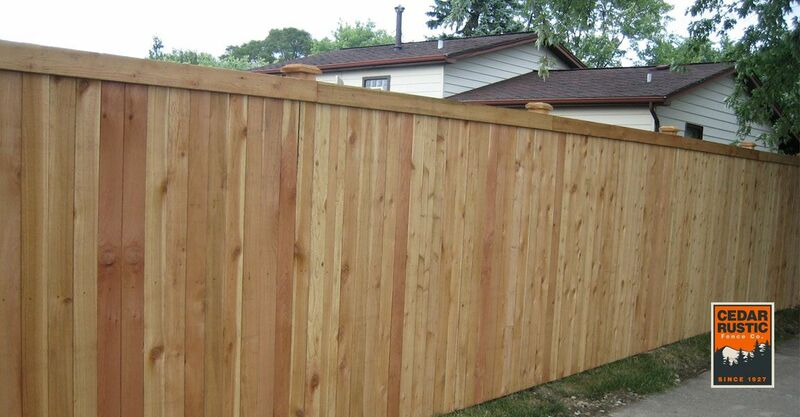 Take a look at this 6’ shadow board cedar fence. Here we are using 1×4 cedar boards, 2×4 rails, and 4×4 gothic posts, using face-nail construction. 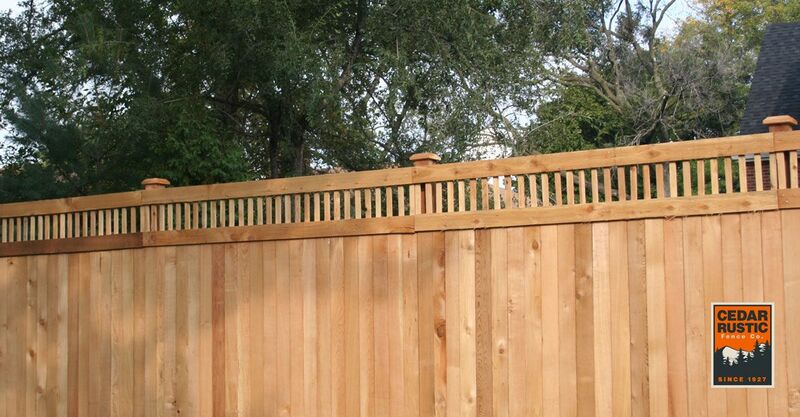 A modern cut scalloped fence was installed with a shadow board style. This picture depicts beveled boards face nailed to 4×4 posts, boasting Gothic tops. This is a lovely fence that would complement any landscaping. A decorative way to close your yard includes this rolling arched shadow board fence. This picture shows dog eared picket tops with 4×4 posts boasting French Gothic tops. It is all put together by face nail construction. This beautiful 6 ft cedar shadowbox fence is constructed using 1×6 western red cedar boards and finished with 1×4 top and bottom face caps, and is the perfect fit for this daycare. This cedar shadowbox fence is built with 1×4 western red cedar pickets, 2×4 frame and face nailed to 4×4 Gothic posts using a rolling arch pattern. 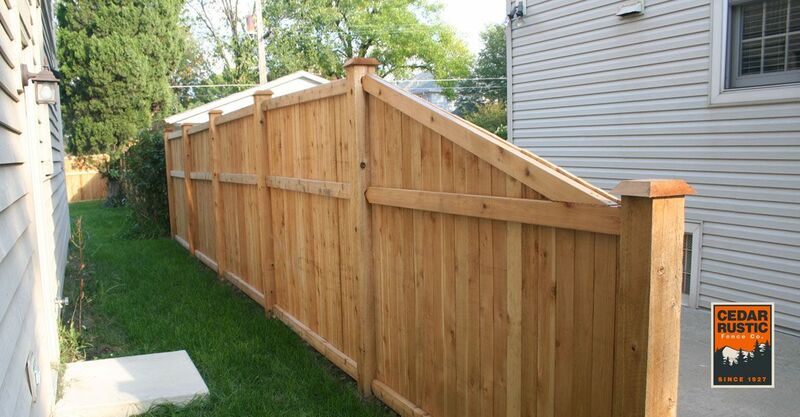 The transition piece is a perfect option when using two different height of cedar fencing in your yard. 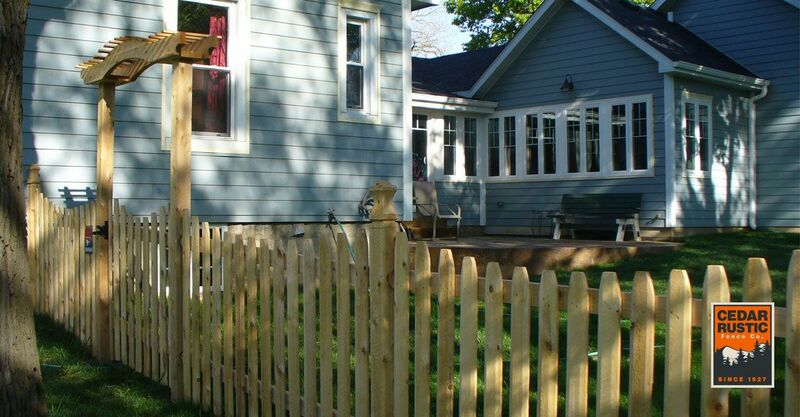 A cedar shadowbox fence is the perfect neighbor friendly option, since it looks the same from both sides of the fence. This shadowbox was constructed using 1×4 pickets and 2×4 framing face nailed to 5×5 posts with a chamfered top. 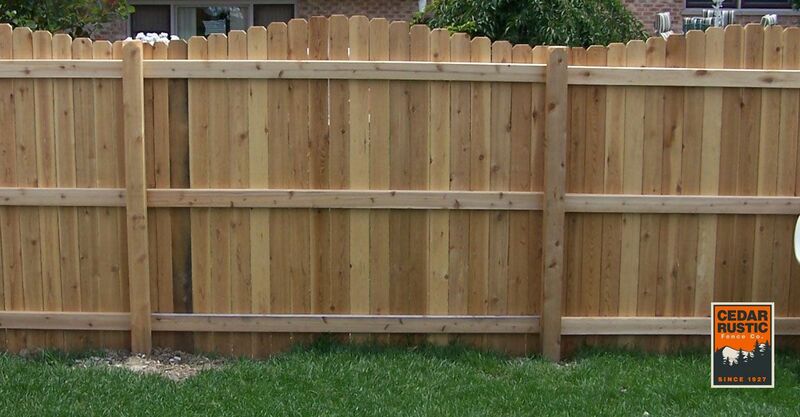 A cedar fence is the perfect addition to any yard! 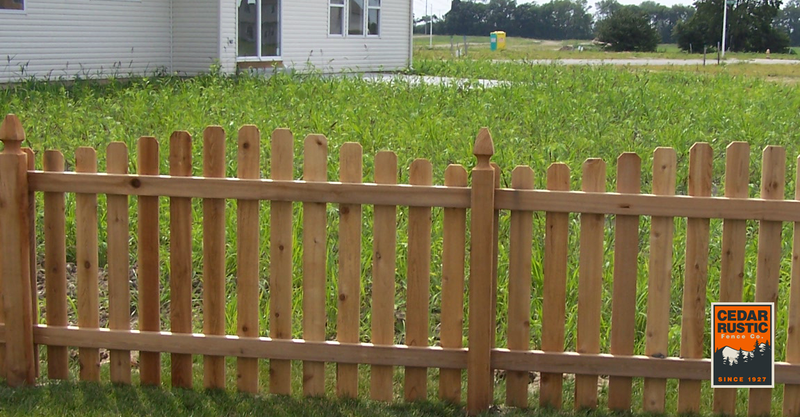 This 4 foot tall cedar spaced picket fence is constructed using 4” red cedar pickets and supported by 4×4 gothic posts. 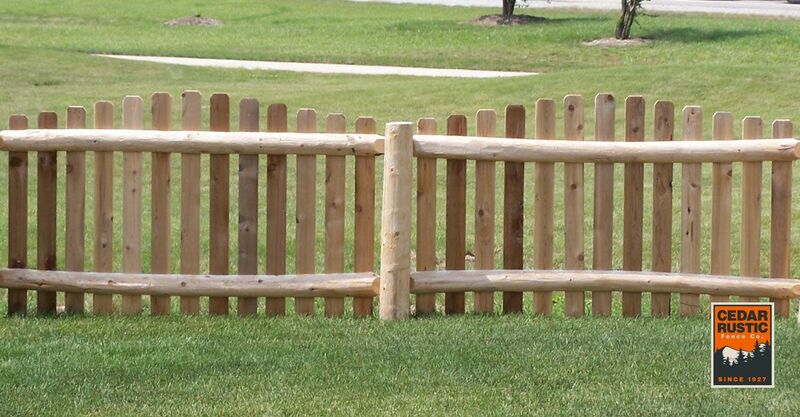 4 foot spaced picket traditional fence with 1×4 cedar pickets, 2×4 framing, 4×4 posts with bevel caps and two 1×4 face caps. 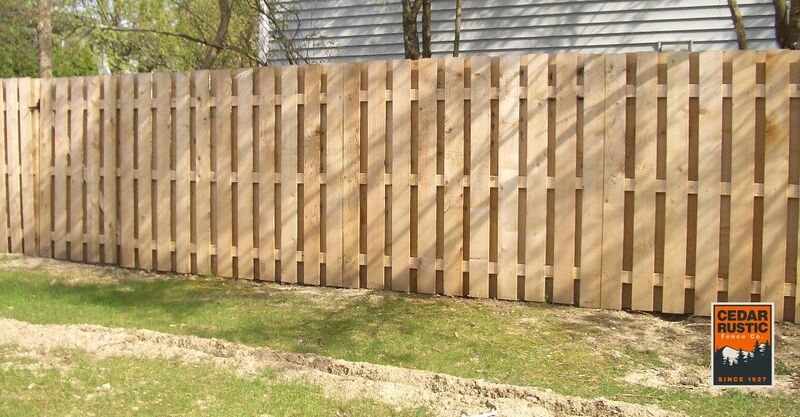 This 4 ft cedar fence shows our V-out pattern which pairs with the 4×4 gothic posts perfectly; this spaced picket fence was constructed using 1×4 boards tightly spaced on 2×4 rails. This simple design works well with all of our cedar styles. 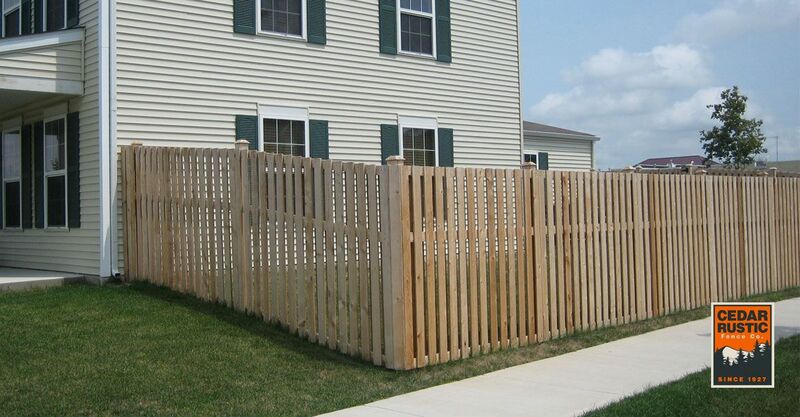 This is a spaced picket fence constructed from cedar, which is a natural decay and rot resistant wood. 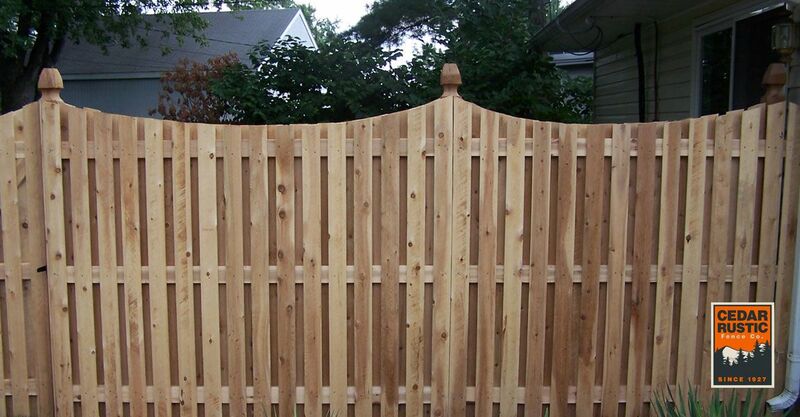 The scalloped pattern paired with the beveled gothic board creates a beautiful fence. 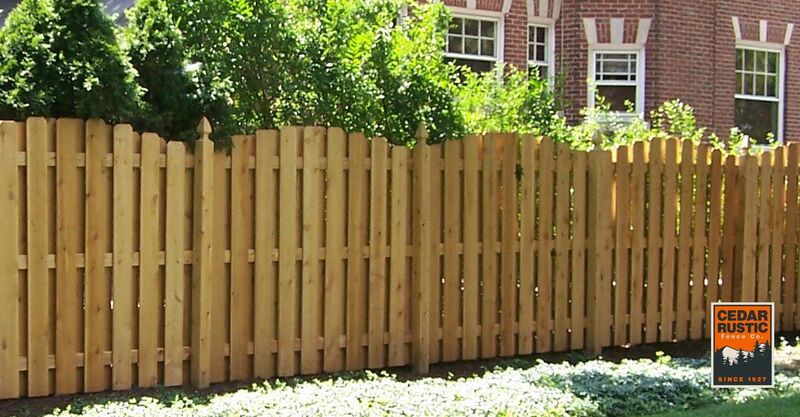 This 5 foot tall tight spaced fence is made with 1×4 beveled northern white cedar boards on northern white cedar ½ log back rails and white cedar round posts. What a great rustic look for beautifully landscaped backyard. Here is a 4 foot tall tight spaced picket fence with 1×4 pickets in a cut scalloped pattern fitted with 2×4 framing into 5×5 French gothic posts. Like the rustic look? 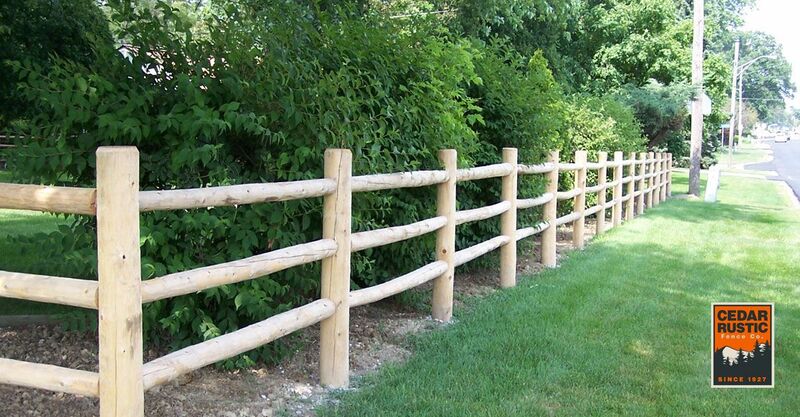 Cedar Rustic offers a variety of rustic fences with ½ log rails and round posts. Contact us today and see all the options available. 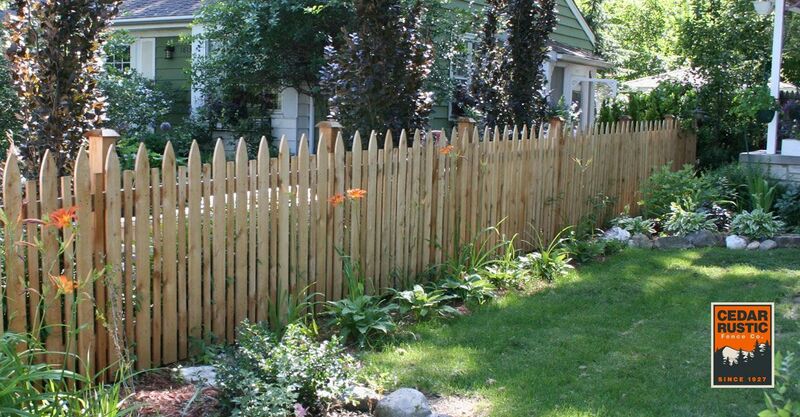 This is a classic 1×4 western red cedar picket fence with dog ear tops. Do you like simple straight lines? 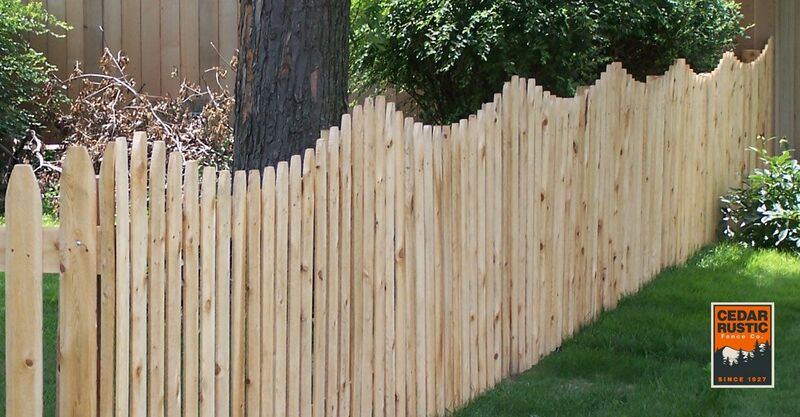 This traditional spaced picket fence will fit your needs. 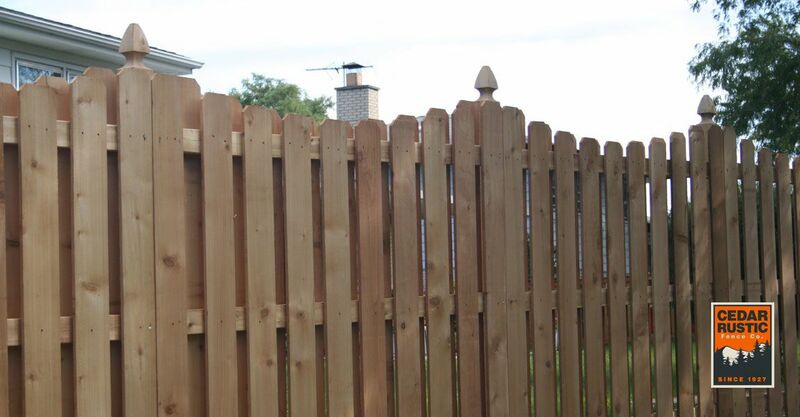 This fence has bevel caps on the 4×4 cedar posts. 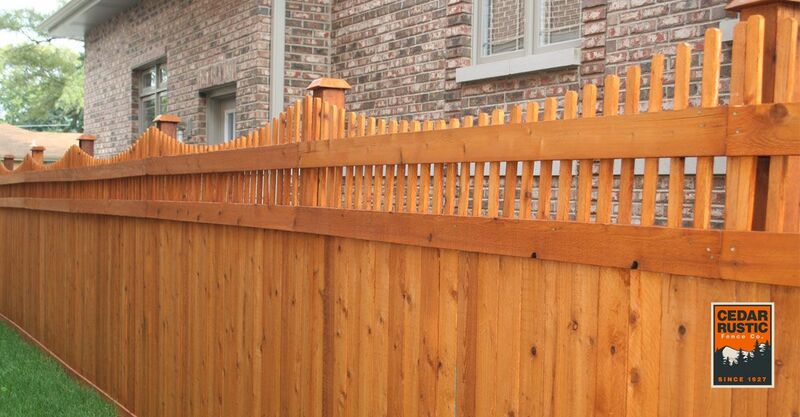 This 1×4 western red cedar picket fence with a cut arch pattern is a beautiful addition to any backyard or garden. 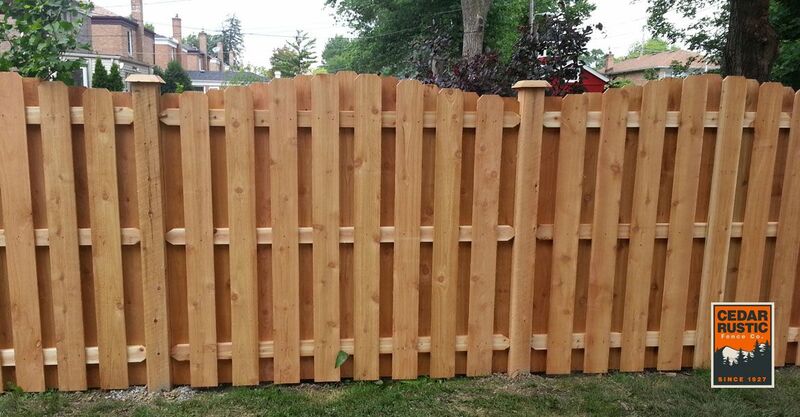 This 4’ traditional spaced cedar fence is constructed using 1×4 western red cedar boards, 2×4 rails, and 4×4 post with Richmond caps. 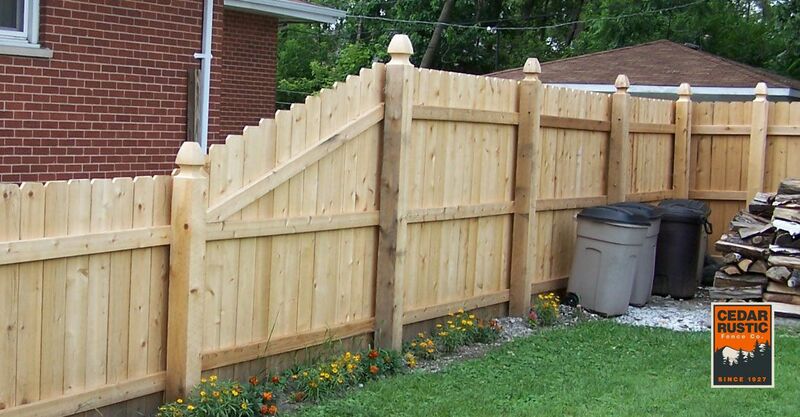 The 3/1 stack and top cap gives the fence a more decorative look. Here we have a 4’spaced cedar fence with a 2 post arbor. 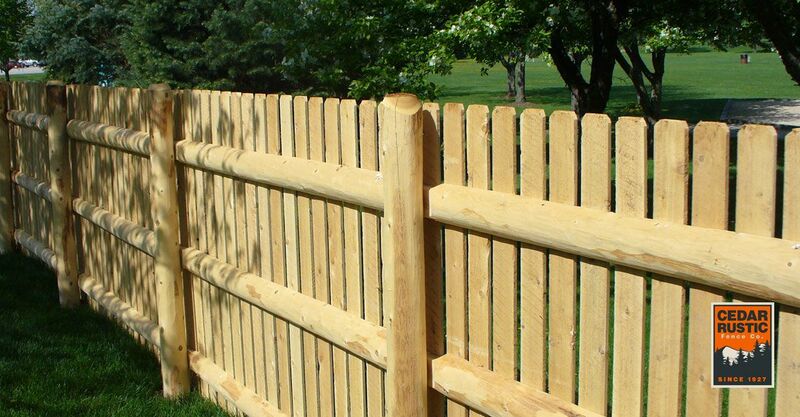 The fence is constructed using 1×4 boards, 2×4 frames mortise & tenon construction using 5×5 gothic posts. The cut scallop pattern brings out the beauty of the yard. 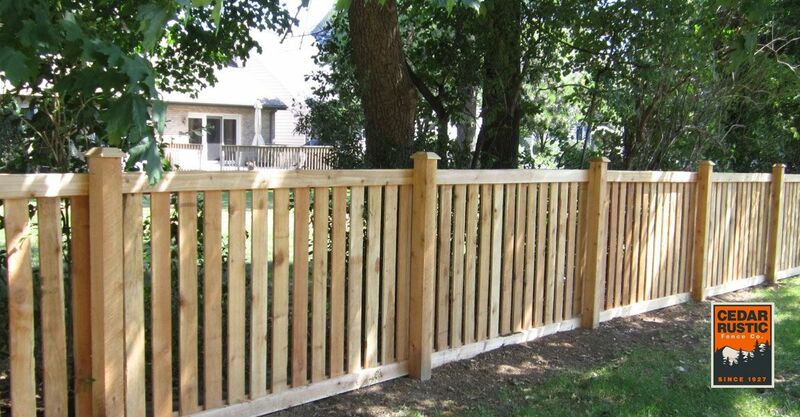 This 4‘ spaced straight top Boston staggered cedar fence is constructed using both 1×4 full point gothic & 1×2 boards. It also has 4×4 posts with beveled caps, and uses a face-nail construction. 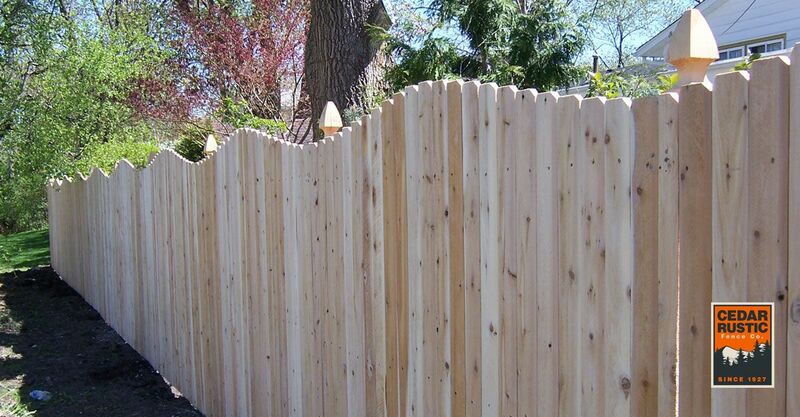 This tight spaced 1×5 northern white cedar fence is both stunning and durable. 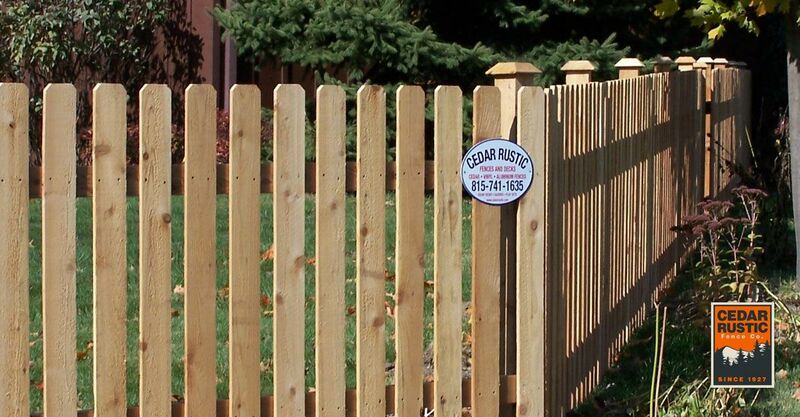 The Traditional Spaced Picket Fence is a modern take on a classic cedar style fence. It has horizontally spaced pickets for a slight view of a nearby walkway. The boards are 1×4 western red cedar and the fence is put together by 2x4x7 framing. The posts have 2 face cap boards with beveled cap tops. 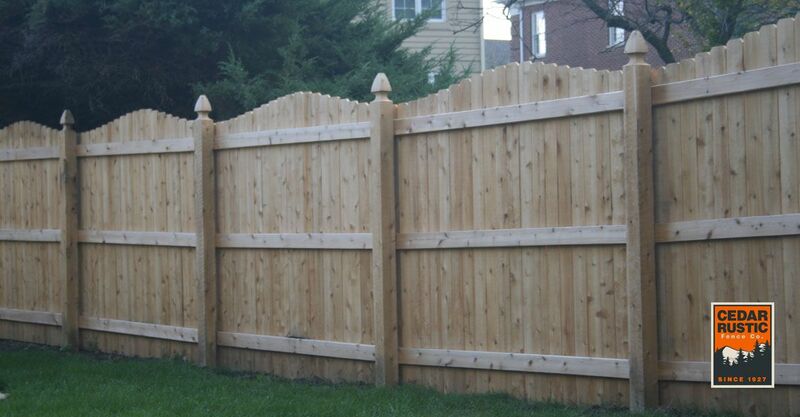 This fence has the look of sophistication for any yard. 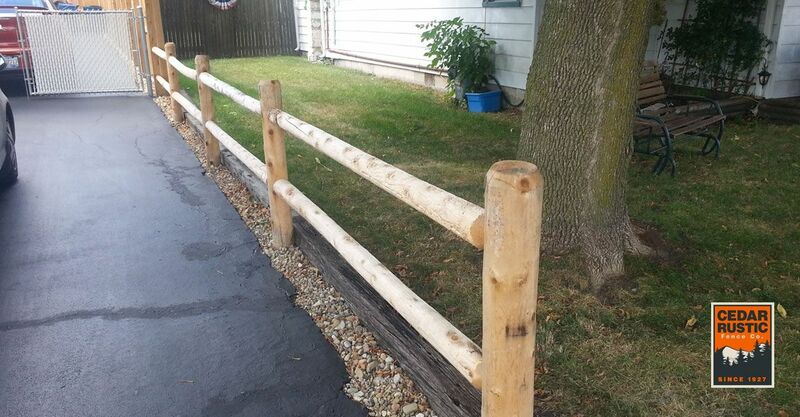 This cedar 3 rail fence gives style along this busy street. It has 3’ round rails with a mortise and tenon construction. The round posts have Chamfered tops. 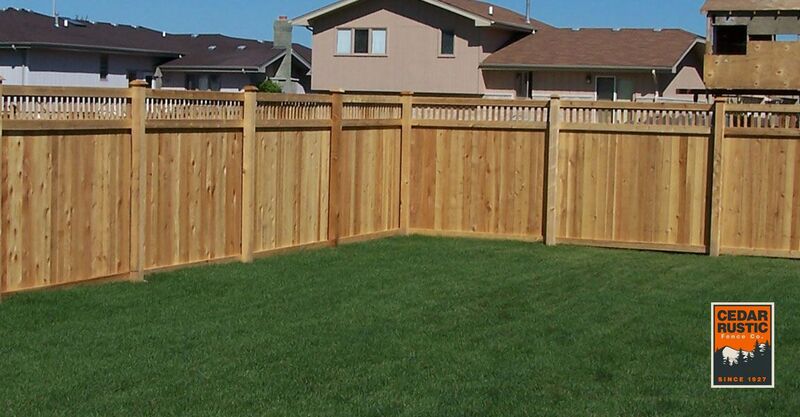 A beautiful cedar fence was installed to give privacy and elegance to this sloped yard. 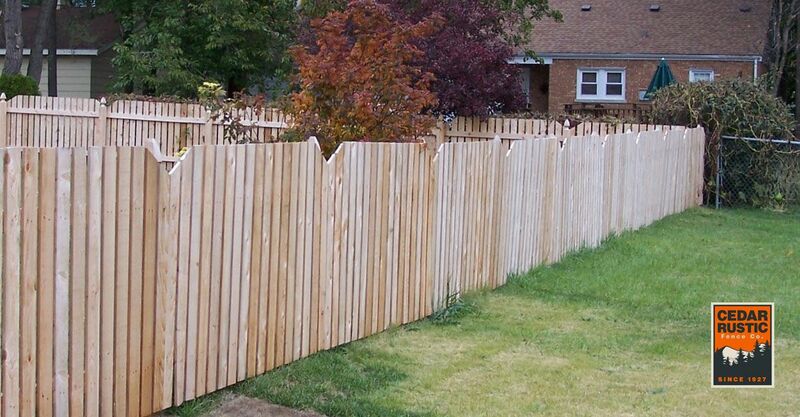 The fence has spaced pickets with dog eared picket tops. The 4×4 post tops are cut in the Gothic style, with the fence having a face nail construction. Our 4’ Cedar Rustic mortise & tenon scalloped fence is constructed with beveled gothic boards, 2×4 rails, and 5×5 Williamsburg posts. As a great finish to this fence, add our 2 post arbor. 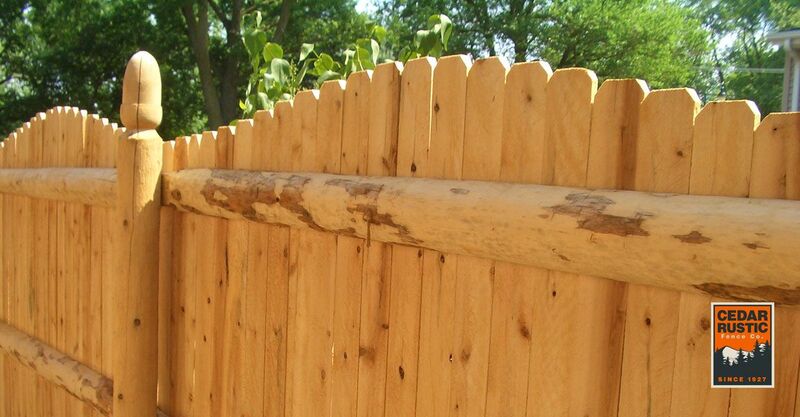 Our round posts and ½ logs create a beautiful rustic cedar fence. 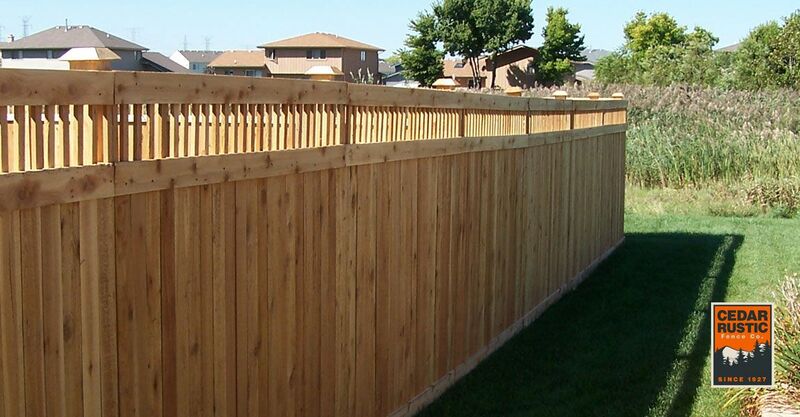 This fence was constructed using 1×4 western red cedar boards. 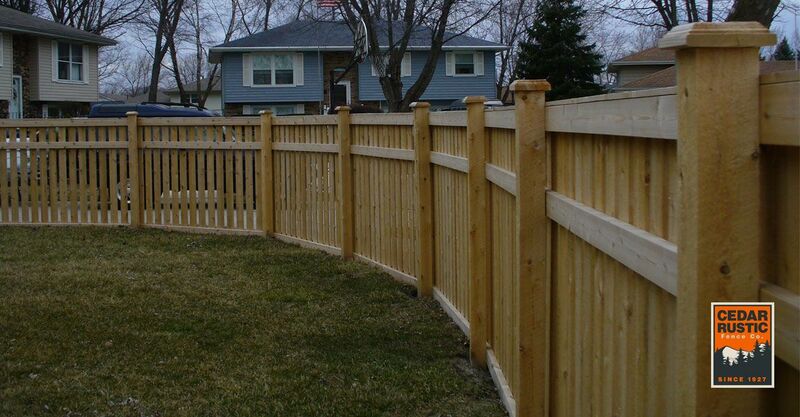 The tight spacing between the boards, give a bit more privacy than a standard spaced fence. The cut arch pattern looks great paired with the round acorn posts. 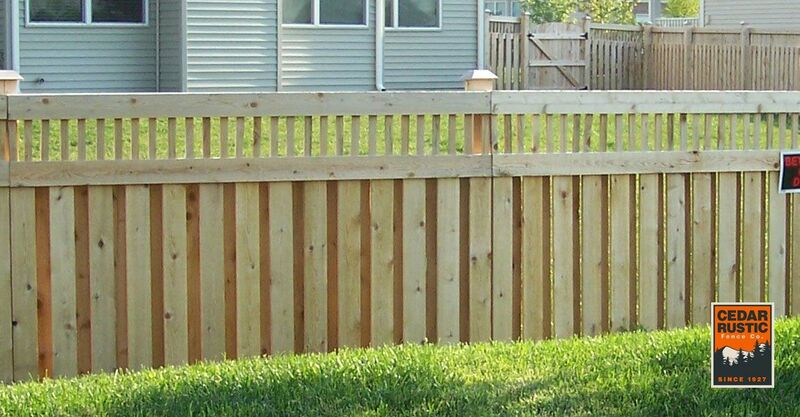 This 2 rail northern white cedar fence consists of nominal 3 inch horizontal rails and 5 inch posts. Also available with 3 or 4 rails. 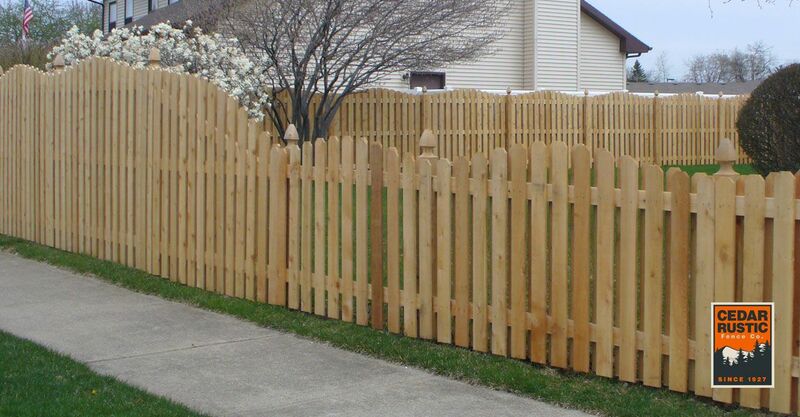 This is a lovely 4 foot tall spaced picket fence with 1×4 western red cedar pickets in a cut arch pattern constructed with 2×4 framing fitted into 5×5 posts and beveled caps. 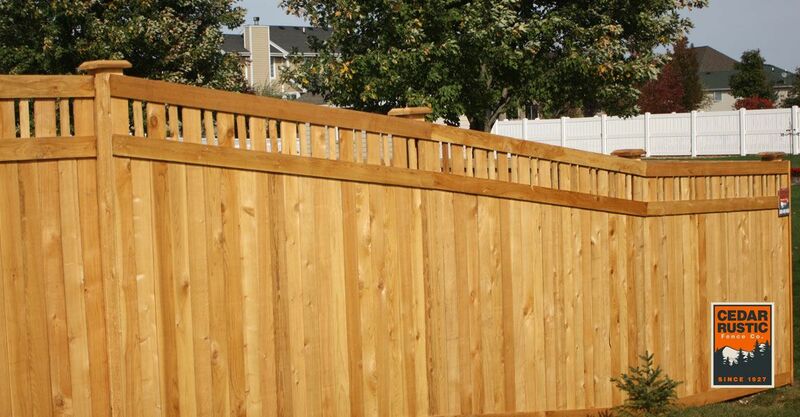 Each Cedar Rustic fence is warrantied for three (3) years against defects in workmanship. Gate closure and locking mechanisms are warrantied for one (1) year against defects in workmanship. Warranties do not cover damage caused by Acts of God, weather, impact or other conditions beyond the control of Cedar Rustic Fence Co. Customer failure to pay in accordance with the contract voids all warranties. All other warranties expressed or implied with limitation warranties of quality, fitness and merchantability, are excluded.